Gem, emerald (oiled), 5mm faceted round, B- grade, Mohs hardness 7-1/2 to 8. Sold individually. Item Number: H20-1117FG Have a question about this item? This faceted round gem is chosen for its fine color. The better grades have good cutting and a minimum of inclusions. B- grade emeralds, pretty and well cut, have fine green color with some typical emerald inclusions. Gem, emerald (oiled), 5mm faceted round, A- grade, Mohs hardness 7-1/2 to 8. Sold individually. Gem, emerald (oiled), 2mm faceted round, B- grade, Mohs hardness 7-1/2 to 8. Sold individually. Gem, emerald (oiled), 3mm faceted round, B- grade, Mohs hardness 7-1/2 to 8. Sold individually. 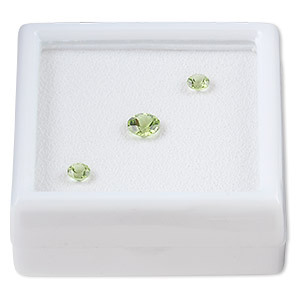 Gem, peridot (natural), 6mm faceted round, A grade, Mohs hardness 6-1/2 to 7. Sold individually. Gem, peridot (natural), 7mm faceted round, A grade, Mohs hardness 6-1/2 to 7. Sold individually. Gem, rhodolite garnet (natural), 5mm hand-cut faceted round, A grade, Mohs hardness 7 to 7-1/2. Sold individually. Gem, iolite (natural), 5mm faceted round, A grade, Mohs hardness 7 to 7-1/2. Sold individually. Gem, pink tourmaline (natural), 5mm round, A grade, Mohs hardness 7 to 7-1/2. Sold individually. Gem, sapphire (heated), 5mm faceted round, A- grade, Mohs hardness 9. Sold individually.